I write to share this New York Times article about my childhood with my best friend, Gurbir S. Grewal (now New Jersey’s Attorney General), and my older brother Amardeep Singh, and our how our distinctly Sikh and American childhood shaped who we are today. When my father came to this country in the late 1960s, he was told to go to a barbershop and remove his turban the day that he arrived. He refused because he truly believed in our country, and its promise of freedom and equality for all. That decision changed my family’s life, and its echoes carry on today in my work as your Mayor to ensure Hoboken is a Fair and Welcoming City, or play a leadership role in supporting our city’s LGBTQ community. As your Mayor, while I take pride first and foremost in working to keep city taxes stable, building city infrastructure, and improving constituent services, I also take pride in representing an inclusive community, particularly at a time when there are so many dividing us at the national level. Thank you. Enjoy the article by clicking here or reading below and have a great week. P.S. My favorite part of the article is when Gurbir engages a homeless man who racially harasses him by taking him out to eat rather than simply condemning him. It’s that spirit of compassion that I strive to bring to Hoboken. In the 1980s, when Sikh immigrants from India began arriving in New Jersey in significant numbers, they lacked a proper house of worship, so they set up a tent on a patch of dirt and began to pray. The tent in Glen Rock, a town in northern New Jersey, has been replaced by an imposing gurudwara, or temple, with a red brick facade and white domes. The congregation that once comprised 10 families now has hundreds of families drawn from across New Jersey and New York, two states that have among the largest populations of Sikhs in the country. Today, after a long history of dealing with bigotry, Sikhs have begun to acquire power. 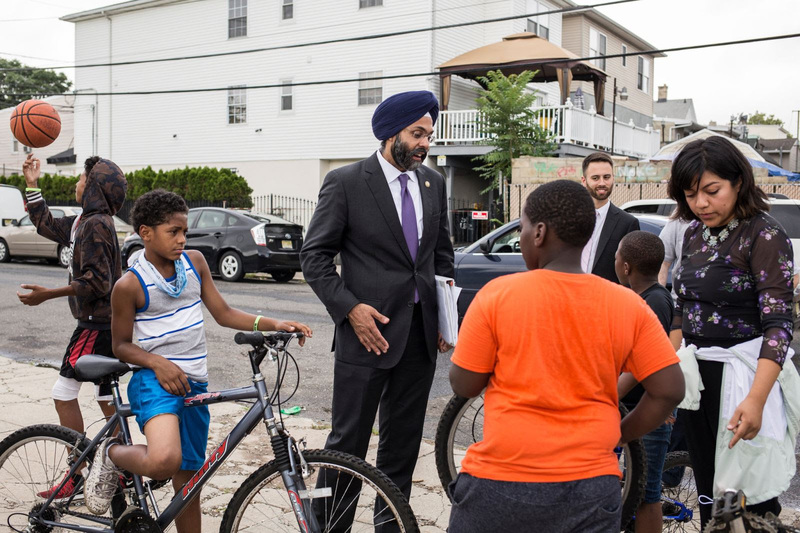 The worshipers in Glen Rock include Gurbir Grewal, New Jersey’s attorney general, and Ravi Bhalla, the mayor of Hoboken, along with Mr. Bhalla’s older brother Amardeep Singh, a founder of the Sikh Coalition, a national civil rights organization. 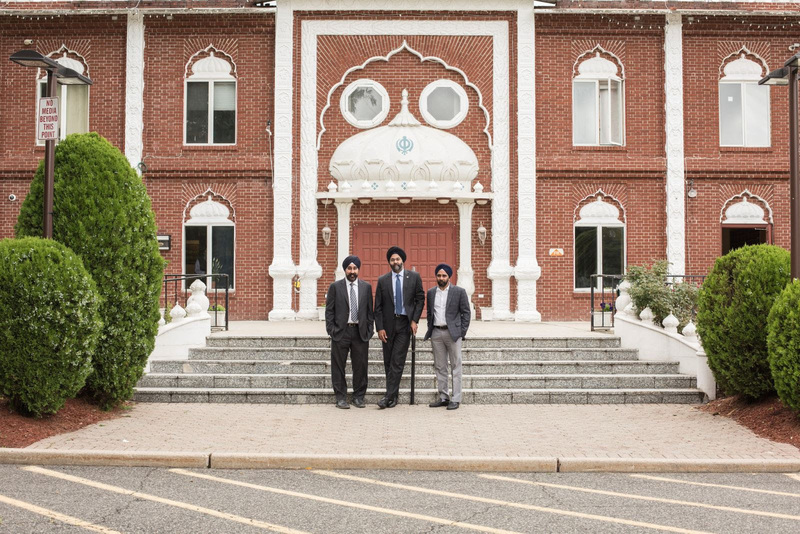 All three grew up together and have attended the temple since they were children — Mr. Grewal and Mr. Bhalla served as best man at each other’s wedding. They are now in their 40s and embody the political maturation of Sikh Americans. They gathered recently in a conference room at the temple to reflect on how their faith has shaped their progressive values. Much has changed since then. The tent in Glen Rock, a town in northern New Jersey, has been replaced by an imposing gurudwara, or temple, with a red brick facade and white domes. The congregation that once comprised 10 families now has hundreds of families drawn from across New Jersey and New York, two states that have among the largest populations of Sikhs in the country. Childhood in New Jersey was marked by “a lot of bullying, a lot of teasing, a lot of animosity,” said Mr. Grewal, who, abiding by Sikh tradition, covered his hair from a young age. But on weekends, within the grounds of the gurudwara life was different. When they were not attending religious instruction, the three boys bonded over baseball or sneaked out for pizza; they got in trouble together. For the small Sikh community in which they were raised, a transformative moment came in 1984. That year, political tensions in the Indian state of Punjab erupted into violence between Sikh militants and the Indian military at the Golden Temple, the most sacred site in Sikhism, a monotheistic faith founded in South Asia in the 15th century that distinguished itself by emphasizing equality for all. Later that year, Prime Minister Indira Gandhi was assassinated by her Sikh bodyguards and her supporters responded by killing thousands of Sikhs. Mr. Bhalla said this bloody period introduced him to “the concept of injustice.” Sikhs began organizing and staging demonstrations in Washington and meeting with members of Congress to raise concerns about human rights. The violence in India prompted many Sikhs to flee; many settled in New Jersey. Estimates of the number of Sikhs now living in the United States range from 200,000 to 500,000, experts said, noting the difficulty in pinpointing the size of religious groups and newly arrived immigrants. He joined Amnesty International, helped form student groups and was the first of the three friends to go to law school. Throughout the 1990s much of the political focus of the Sikh American community was centered on what was happening thousands of miles away in India. Then came Sept. 11. The attention immediately turned inward as Sikh Americans, particularly men wearing turbans, were victims of hate crimes, including Balbir Singh Sodhi, the owner of a gas station in Arizona, who was fatally shot. At the time, Mr. Grewal was working in commercial litigation at a private law firm in Washington and he remembers some of the looks he got in public. One homeless man, he said, would routinely accost him outside his office building. “He’d start yelling at the top of his lungs, ‘I found him! I found him! I found bin Laden!’” Mr. Grewal said. Eventually, after trying to avoid the man, Mr. Grewal said he took him to a McDonald’s. 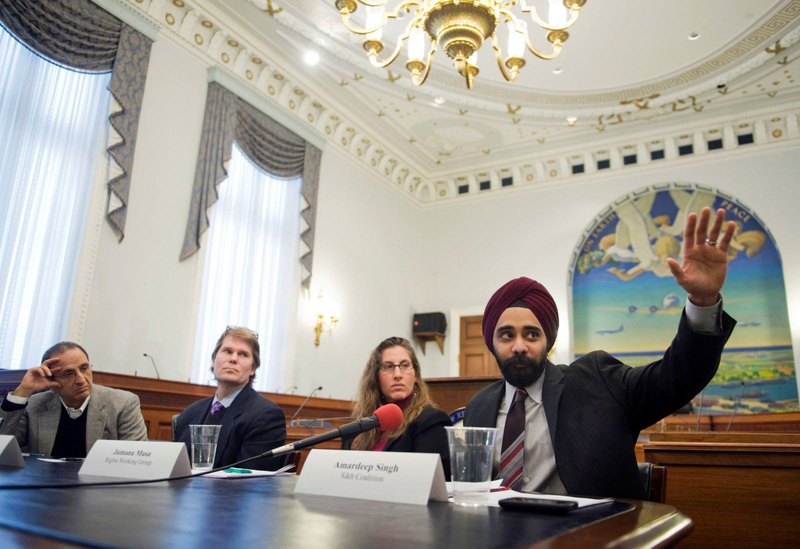 For his part, Mr. Singh worked with others to form the Sikh Coalition, met with Attorney General John D. Ashcroft and helped ensure that protections for Sikhs were included in the Patriot Act. They also persuaded the Department of Transportation to issue guidelines on searches of Sikh passengers and pushed the Equal Employment Opportunity Commission to educate employers on workplace discrimination. Mr. Bhalla said this basic Sikh value — he described its modern, secular equivalent as “radical egalitarianism” — explained his first executive order as mayor, declaring Hoboken to be a fair and welcoming city. He followed this with an order intended to protect transgender people by making all single-occupancy public restrooms gender-neutral. While the concentration of Sikhs in New Jersey is a relatively recent development, Sikhs were among the earliest South Asian immigrants in the country, arriving over a century ago to work primarily as farmers and loggers on the West Coast. Their presence inspired one newspaper in Bellingham, Wash., to ask, “Have We a Dusky Peril?” in 1906, amid fears “that the dusky Asiatics with their turbans will prove a worse menace to the working classes than the ‘Yellow Peril’ that has so long threatened the Pacific Coast. Not long afterward, a mob of white men violently expelled nearly 200 immigrants from the town. In the ensuing years, anti-immigrant hysteria grew, resulting in laws blocking immigrants from India and other predominantly nonwhite countries that were eased in the 1960s and prompted a new surge in immigrants, as well as a backlash. For Sikhs, one of the worst acts of religious violence occurred in 2012, when a gunman killed six people in a Sikh temple in Wisconsin. Now Sikhs are starting to gain more political prominence across the country. They include Manka Dhingra, a state legislator in Washington; Preet Didbal; the mayor of Yuba City, Calif.; and Harmeet Dhillon, a Republican Party leader in California. Still Mr. Grewal, who was appointed by Gov. Philip D. Murphy, a Democrat, and is the first Sikh to serve as a state attorney general, has had to contend with intolerance. In July, two New Jersey D.J.s, Judi Franco and Dennis Malloy, called him “turban man” and Mr. Malloy said he would not refer to the attorney general by name until he stopped wearing a turban. After a public outcry, the two were suspended for 10 days. Ms. Kaur said she and other Sikhs regularly draw upon “the Sikh spirit of Chardi Kala,” meaning a positive attitude, even in the face of adversity. This principle may help explain why the three childhood friends from the temple in Glen Rock are optimistic about the country’s future.